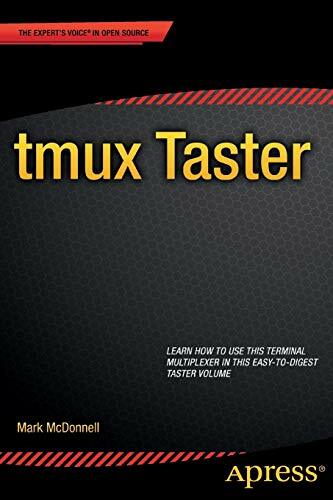 tmux Taster is your short, concise volume to learn about tmux, the terminal multiplexer that allows you to multiplex several virtual consoles. With tmux you can access multiple separate terminal sessions inside a single terminal window or remote terminal session, and do so much more. Through the seven to-the-point chapters, you'll learn the fundamentals of tmux, scripting and automation, pane and window management, pair programming, and workflow management. Increase your productivity by using a terminal multiplexer - start with tmux Taster today. London based software engineer, Mark McDonnell works at the BBC (currently as a senior core engineer for their biggest product: BBC News). Over the past 15 years Mark has worked his way up the ranks of the agency lifestyle. Along the way he has built software applications in Classic ASP, ASP.NET, Flash, PHP, Node and Ruby. He had the pleasure of managing and mentoring teams of highly talented developers for a few years before moving onto the BBC as a responsive front-end specialist (and then as a full stack cloud-based engineer for their Tier 1 election events). He is a lover of the Unix philosophy and the power of the command line and relishes opportunities to learn new technologies.